Hot on the heels of Hidden Figures’ recent Academy Award nominations, including one for best picture, Lego has just revealed the next fan-designed set it’s officially putting into production, and it also celebrates women who have played key roles in the history of the US space program. Maia Weinstock’s Women of Nasa Lego Ideas submission reached the requisite 10,000 supporters needed for the toymaker to consider it for production a while ago. 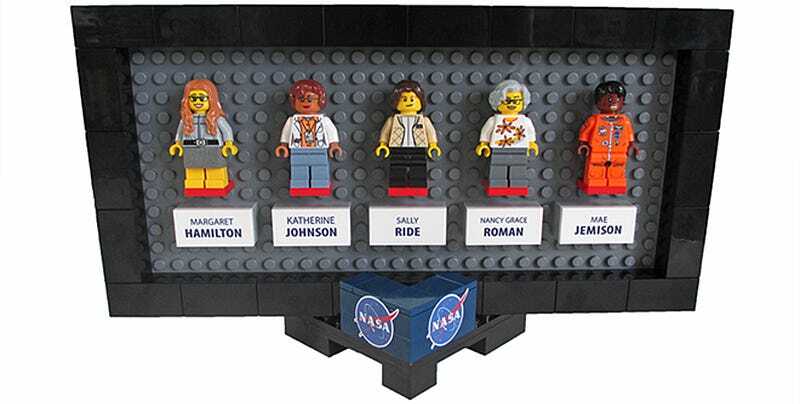 But today, Lego revealed that it has officially given Weinstock’s creation, which includes a desktop frame for displaying the five minifigures and various NASA-themed mini vignettes, the thumbs up for production. The final version of the set will look a little different than Weinstock’s does, as Lego’s designers need to ensure it’s production-friendly, but it should hit store shelves sometime later this year, or in early 2018 at the latest. Featured in Weinstock’s Women of Nasa collection are Margaret Hamilton, a computer scientist from MIT who helped the develop the flight software for the Apollo Moon missions. Last year, Hamilton was awarded the Presidential Medal of Freedom for her contribution to the success of the Apollo 11 Moon landing. The set also includes Katherine Johnson, a mathematician and NASA researcher who helped calculate trajectories for the Mercury and Apollo programs. She was also featured in the film Hidden Figures, and recently made an appearance at the Academy Awards. The set will not only help educate everyone about the role that women have played in our exploration of space, it will hopefully show girls that they too can grow up to be the next trailblazers in science, technology, engineering, and mathematics.